Imagine that you are driving down a road in a town that you are visiting, when all of a sudden you notice that you are about to run out of gas. What is the first thing you look for? Chances are that you’ll notice the sign first—tall, well lit, and with the ever-changing gas prices displayed in bold numbers—before you can even make out the gas pumps. We currently live in a world that is constantly driving information towards the consumer market. Think about how many times you’ve walked or driven past a business sign or advertisement without giving any attention to what these entities are trying to convey. We’ve become desensitized to the amount of advertisement we are flooded with on a daily basis; however, a well-constructed sign is the first step to improving the overall marketing strategy of your business. It’s your first chance to make a great first impression. So how do you make a business sign that stands out from the rest? Think back to the gas station reference. While various gas station companies exist, their signage all contain similar qualities. The consumer is able to distinguish a gas station sign from other business signs; it’s difficult to mix up a gas station sign with that of a fast food restaurant. In this article, we will focus on how to better improve your sign through the means of catching the consumer’s attention, brand reinforcement, and promotional processes. When you are ready to design & construct or upgrade your sign, make sure you work with the best in the field: Ram Studios Signs! A sign is typically the first step in a business’s efforts to improve their overall marketing strategy. A sign quickly and easily attracts new customers, and is economically feasible since you are not continuously throwing money into it like you would with paid advertisements such as radio or newspaper ads. A sign is also your chance to make a great first impression. Keep in mind that consumers pass by a multitude of signs each day. You want a sign that stands out from the rest. An attractive sign placed in a prominent location will catch the eye of passersby and help to improve your walk-in business. A distinguishable sign also makes your location easier to find, especially for those consumers that found you through alternative means of advertisement. Introducing and reinforcing your business brand is important to how the consumer views your business overall. Again, you want a sign that will catch the attention of passersby. Consider the image you want your business to be associated with. Having a business logo is beneficial in the design of your sign, along with the colors you choose specifically for your business. A catchy advertising slogan can also help consumers remember who you are. The more memorable your logo, color scheme, and slogan are, the better your chances are of attracting customers. The look of the sign is not only important to the exterior of your business, but also the overall visual presence. You will want to design a sign that is consistent with the business in its entirety. This includes uniformity in the use of your business logo, company colors, and catch phrase. Your letterhead, business cards, and print advertisements should reflect the design of your business sign. All of these elements help to create a top-of-the-mind awareness. This occurs when your business is the first to come to mind when a consumer is in need of a particular set of services that your business provides. By utilizing all of these elements—from employing a prominent sign to uniformity in logo and design— you are successfully building and reinforcing your business through repetition. This attracts both new and existing consumers. Is change a constant for your business? Maybe your business wishes to use its sign for promotions you’re currently running. Or you would like to showcase an award your business just won. Whatever the case may be, your business is an ideal candidate for the use of transitional signs. Let’s return to the gas station example. 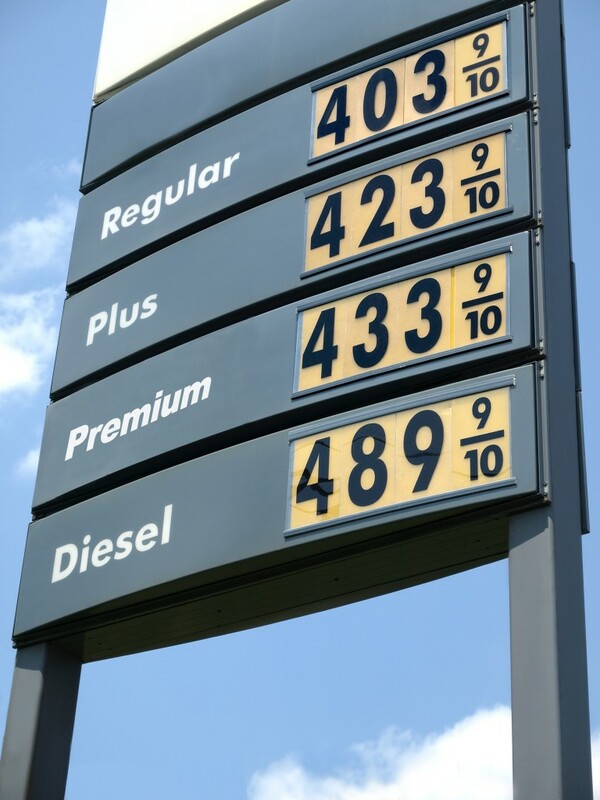 Gas prices are constantly changing, and therefore need a sign that can easily change with the price trends. Many gas stations still use the interchangeable numbers. For those that have recently upgraded, the use of an LED screen is beneficial for quick and easy changes. For businesses that wish to utilize this style of business promotion, using an LED sign is a great way to get your message across. The constant change within your business helps build awareness within your consumer market, and keeps the consumer up-to-date on what’s going on with your business. For the passersby, the information they receive from a transitioning sign allows them to better understand what services or products your business provides. 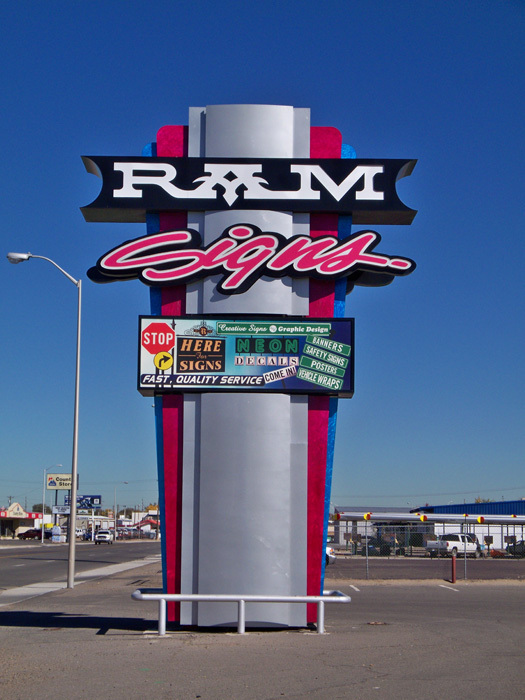 If an LED sign is in your future, keep in mind that Ram Studios Signs specializes in the design and installation of LED signs. A business sign is the key player and most important feature in your marketing strategy. Whether you are looking for a sign that helps the consumer more easily locate your business, or you want to display seasonal business promotions, Ram Studios Signs is ready to help you create or improve your business sign!